For a night aiming to help provoke memories of great cinematic moments, it sure brought out a lot of emotions--not just for the audience, but most especially for the performer. Being among the throngs of Regine Velasquez fans at the “Regine at the Movies” concert last November 25 at the New Frontier Theater, one didn’t expect less from the new Kapamilya -- she’s Asia’s Songbird, no less. And yet, even after two jam-packed nights, fans were awed by her unrelentingly lucid and breathtaking voice, as she churned out song after song from unforgettable movie soundtracks. Through favorites such as “Never Enough” from The Greatest Showman, “Only Hope” from A Walk To Remember, “I’ll Never Love Again from A Star is Born and My Heart Will go on from Titanic, as well as her own film discography with “‘Till I Met You” and “Pangako”, the Asia’s songbird managed to not only provoke emotions and memories for the thousands in attendance, but also for herself. Even as she returned to the Kapamilya network, she showed gratitude to her long-time home, GMA, on the night, thanking them for the 20 years she spent in the network. It was hard to imagine Regine Velasquez to have been in the industry for that long, especially as the voice she put on that night was just as crystal-clear as before. Nevertheless, it was the long, hard reality that performers like her had to take. By then one realizes that she must have gone through every sort of faux pas -- cracking mid-verse, wardrobe malfunctions, as well as not being able to sing at all. But she powered on, she has proven that she is one of the industry’s greatest entertainers today. On stage she was joined by guest performers--on Friday night, it was Piolo Pascual, then Sharon Cuneta on Saturday, and on the final night, she was with Daniel Padilla, to the delight and excitement of both of their adoring fans. Those among the audience got to witness a different Regine--a renewed Asia’s Songbird brimming with humanity and humility. After singing “Never Enough,” she thanked the fans for their appreciation of her performance. “Sobrang kinabahan ako kasi I didn’t think that I could sing that song,” she said. She also pulled off a stunning performance of Lady Gaga’s songs from the A Star is Born soundtrack, which she chose because she said that she “related” to the messages in the song and the movie. 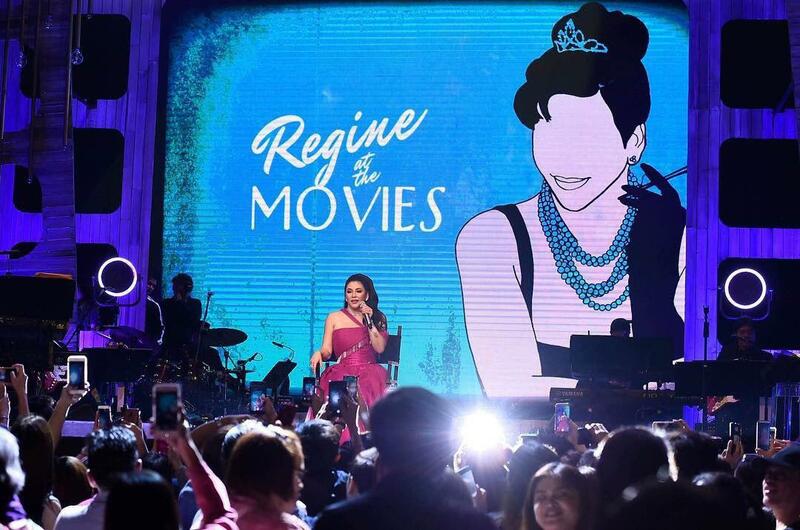 This affinity for the movies may be taken for granted of Regine, but being a celebrated performer in films herself was something quite lost on her at first. “I could never imagine that I could become an actress,” she says, recalling her experiences making her film with Aga Muhlach, Pangako, Ikaw Lang. But Regine need not have gone through all these worries. Throughout the night, she was greeted with ovations galore, and clearly she was exhilarated, looking forward to the next steps in her career. If the cheers that rang long after the concert has finished are any clue, then we are with her in that journey as well, figuring out what will happen next. Get your tickets to Park Bo Gum's Manila fan meet! Inigo Pascual teams up with Australia’s biggest YouTube star on new single "Mr. Nice Guy"
Limited seats added for Lauv in Manila!